So what do I think? It’s a great shower gel, produces a nice lather, does not cause dry skin nor does it irritate. As for the fragrance, I think it has a subtle hint of peach which I admit was a bit disappointing at first as I was expecting fruity overload. However, I asked my sister to take a sniff and she said it was very peachy. Just goes to show that everyone's sense of smell is different. I must say some days it smells peachier than others. Organic Surge shower gels contain natural fragrance and are free from SLS and parabens. I purchased this shower gel at my local Waitrose for £3 (250ml tube) but they are available via the Organic Surge online store. Peach Passion is one of six fragrances. You may prefer to try Tropical Bergamot (Sweet Orange & Bergamot), Fresh Ocean (Lemon, Rosemary & Lime), Gentle Meadow (Lavender & Geranium), Sugared Almond (Almond & Palmarosa) and Citrus Mint (Peppermint, Lemon & Orange). Has anyone else tried these shower gels? What did you think? I'm nearing the end of my current bottle of shower gel so I will have a look to see if I can get this in town. 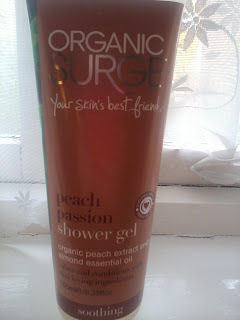 Sounds lovely as most shower gels dry out my skin. The peachy scent sounds great! @Su it is a nice shower gel I am tempted to try out some of the other fragrances I'm curious as to what Sugared Almond smells like.